Weekend trip cancelled due a chest infection but after weeks in the office, I had to get out. I took a wander along the river at Burton-upon-Trent. I love that instant feeling I get, better than any drug (not that I'd know) and you know the best bit of the walk? It absolutely pissed it down. And it was wonderful. The smell of the rain was so intense and it ran off my jacket onto the legs of my jeans and soaked them through and all in all it was just wonderful being out. Then I went home and got a bit carried away on a shopping spree. 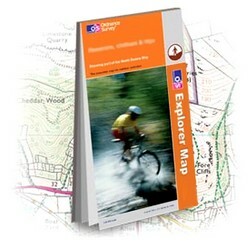 Well OS maps were 3 for 2 and you know you'll use them at some point right? I love having a new map, it's like the very beginning of a new trip, the seed from which it will form. Once you've got the map you can start planning. I could spend hours just looking at a map, its contours and features and not even make any decisions, just enjoy exploring the area through my eyes and the paper. I also bought Backpackers Britain: Wales which was absolutely brilliant as a starting point for planning a 4 or 5 day trip. Our trip to the Rhinogs always stands out in my mind for the wild camping, the challenge of the hike and the sense of achievement that followed and I've been longing to challenge myself again in that way ever since. The book has a route plan for each major hill or mountain range in Wales, along with suggestions for wild camp sites, bothies or other places to stay. It's very unlikely we'll take a hike from the book and walk it step for step but we'll certainly use it as our inspiration and a trip to the Carneddau looks like it may be in order. wow, i can feel your enthusiasm from here ... love it. Rain running down the legs of your jeans, the smell of wet grass and rain in the air .... cant beat it. Great post... ive been wild camping near Snowdonia just the once.....loved.. so raw. I live in Wales and absolutely LOVE camping here. I think the only other place that's got close to me and my friends with our raw campfire at the top of Snowdonia, is when we did something similar up in Scotland. North Wales, is so perfect for wild camping, we actually walked for three day around and through the Rhinogs without seeing a soul - plenty of birds of prey and wild mountain goats. Until we got onto the roman steps of course. Nice Article, I can't wait to get home to North Yorkshire for Christmas and get out into the countryside. Working in London in finance doesn't have the same nostalgic appeal that going home to my parents farm has! Getting a Garmin 62s for Xmas http://www.aboveandbeyond.co.uk/.garmin-gpsmap-62s-handheld-gps-with-1-50k-gb-discoverer-full-uk-map_753759969462.htm, so hoping i can pass over into the lakes a couple of times and test it out!